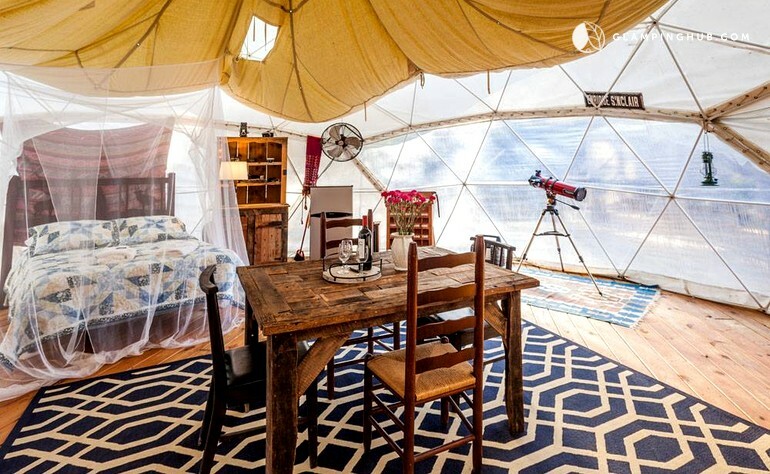 But for us, there’s another way to approach camping, sometimes known as “glamping,” and that involves creating as luxurious an environment as possible. It involves giant tents, air mattresses, electricity, and sometimes even TVs and a stereo system. The food is gourmet, cooked on a fancy camp stove, with cocktails and wine. Think Tom Haverford on the TV show “Parks and Recreation”: a giant tent filled with gadgets he ordered on Skymall. Like how that sounds? 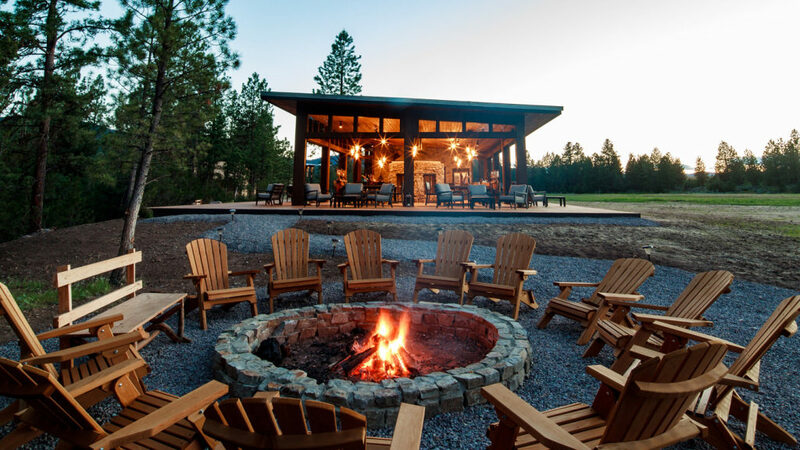 Check out these campsites that are packed with luxury and comfort! This luxury dome fits up to five guests with three beds and has a private bathroom, an outdoor bathtub, and an outdoor shower. While the dome gets warm inside during the summer, it has a series of fans that create a cool evening breeze. The “cowboy kitchen” has a two-burner gas camping stove, a charcoal barbecue, a toaster, a coffeemaker, pots and pans, plates, cups and utensils, and a picnic table. This camp sits on a bluff overlooking the Blackfoot River and has several options for tents, including three-bedroom/two-bathroom tents. The camp also has a dining pavilion with collapsible glass doors for an indoor-outdoor convertible space, plus ensuite bathrooms with heated slate floors and plush bedding. 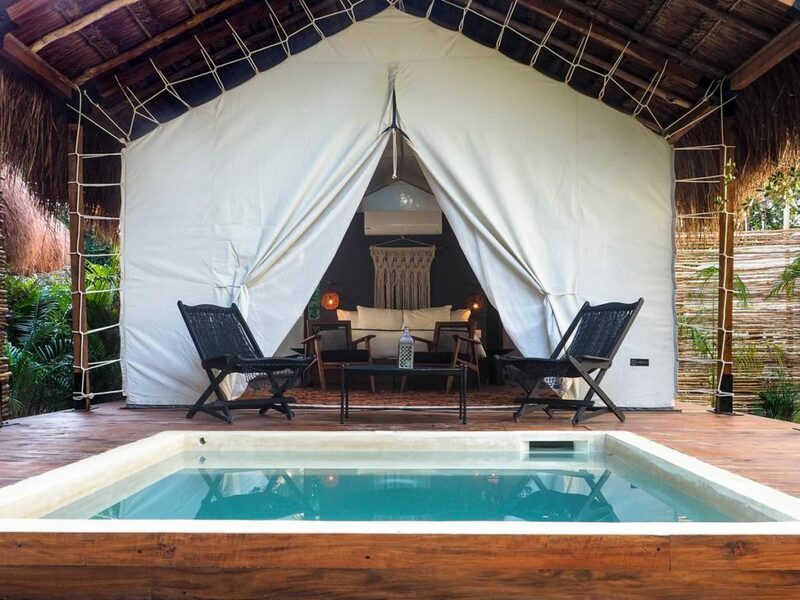 Located between the jungle and the Caribbean Sea in the beachside town of Tulum, Mexico, Habitas Tulum offers a secluded beach and safari tents on a site built in collaboration with local carpenters and artisans. This eco-safari resort on the west coast of Vancouver Island, British Columbia, Canada is accessible only by seaplane, helicopter or boat and sits in a UNESCO-designated protected Biosphere Reserve. 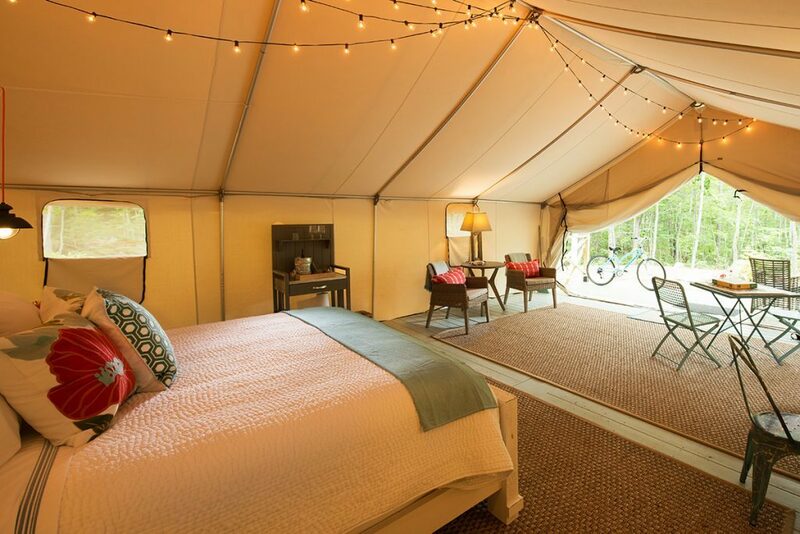 Guests at the resort stay in white canvas prospector-style tents outfitted with cast iron stoves, ensuite bathrooms with heated floors, private outdoor showers, antique furnishings, and linens. 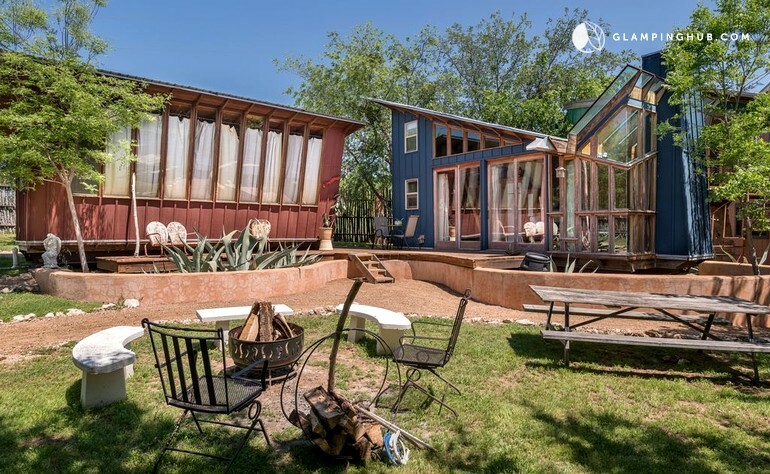 This cabin near Austin, Texas was built by environmentalist architect Marley Porter and has a queen-sized bed, a detached bathroom, a garden bathtub and a private deck. Amenities include a small flat-screen TV, mini-fridge, coffee maker, microwave, toaster oven, and two grills. 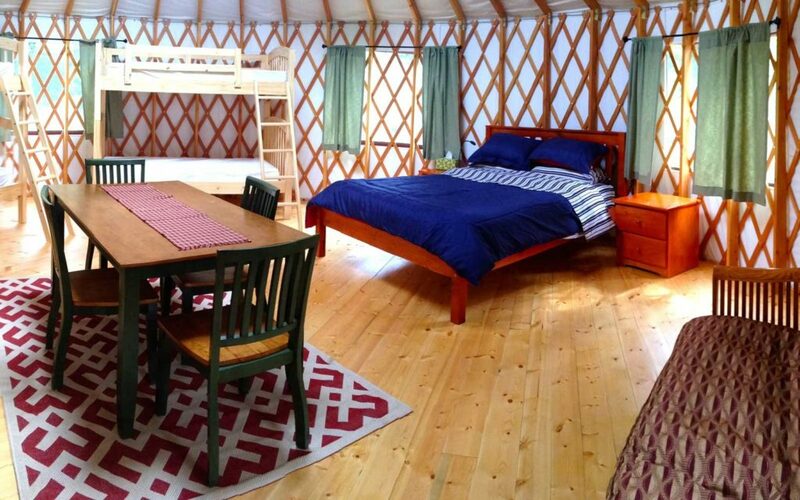 Choose from four yurts on the property: a 30-foot yurt, a 24-foot yurt, and two 20-foot yurts. Each has a kitchen area equipped with a refrigerator, a microwave, a coffee maker, a toaster oven, and dinnerware, plus beds, a heater and a fan, a sofa, a DVD player, and electricity mod cons. When you arrive, you’ll be greeted with a welcome pack that includes ice cream or ice-lollies, milk, water, coffee, tea, and cookies. This resort in Virginia offers three treehouses that overlook the Blue Ridge Mountains and the Dan River. 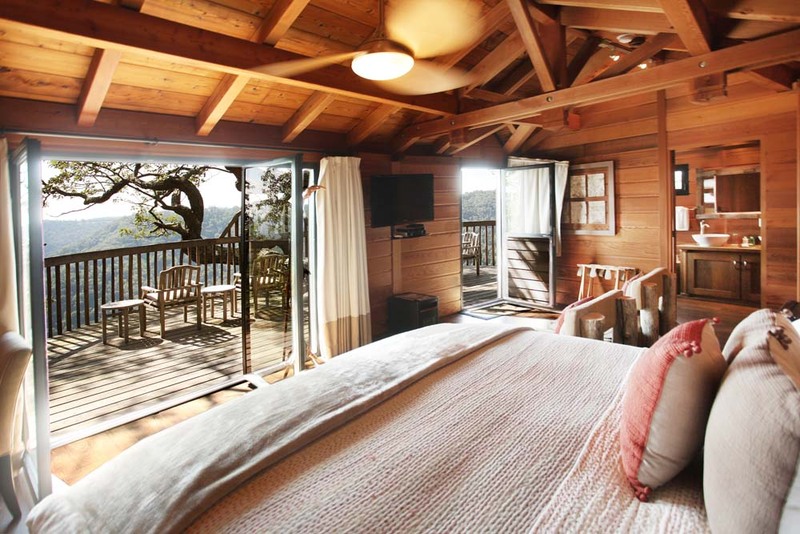 The cabins are built around branches of trees more than 2,000 feet off the ground. Unlike your typical treehouse with a “no grownups allowed” sign on the door, these are the reverse: kids and pets are not allowed and occupancy is limited to two people. 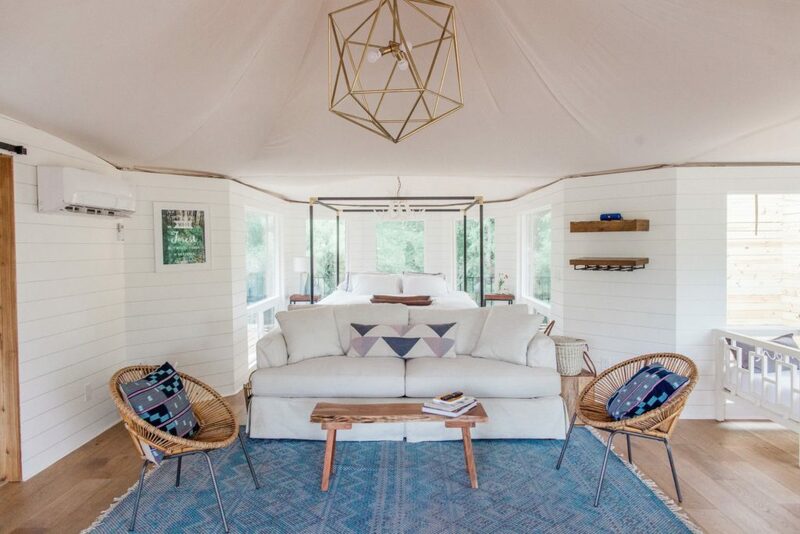 This resort 40 miles outside of Austin on the San Marcos River has three luxury tents that guests can use for a full glamping experience. Each has a free-standing tub, walk-in shower, outdoor shower, mini fridge, king bed, queen sleeper sofa, air conditioning and heat. While you stay in the tent, you can make use of free Aveda products and a golf cart for each tent. 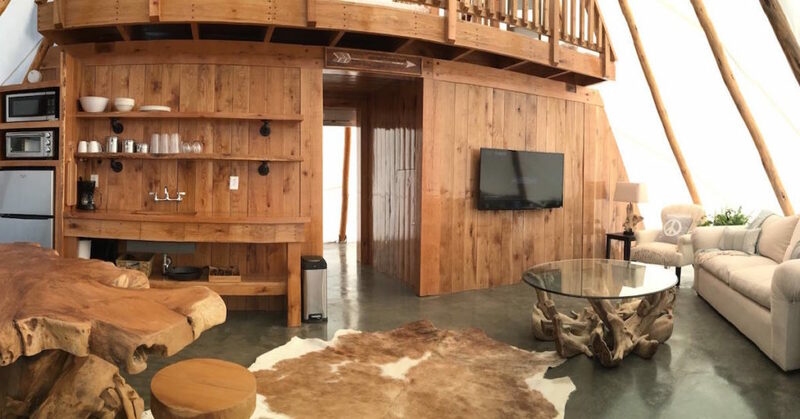 Stay in a 650-square-foot luxury tipi with heated floors, air-conditioning and full bathroom and kitchenette. 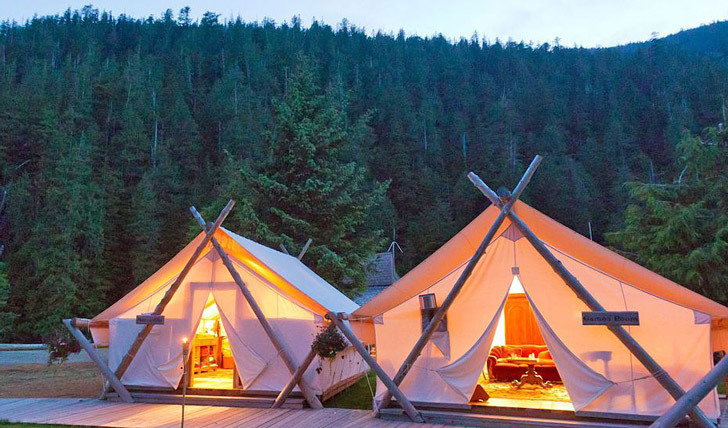 Each tipi has a queen size bed and luxury linens. During the day, you can try out canoeing on the Appomattox and Sandy Rivers, biking on the High Bridge State Park or do a session at the Adventure Park with 60 obstacles and 20 zip lines. This campground just opened last year and was founded by hoteliers Tim Harrington and Debra Lennon. They created 12 safari-style Glamp Tents, each one created by a different New England designer. This season, they added two new types of glamp accommodations, Camp Carriages & Hideaway Huts, with chandeliers and antique furnishings.